Both the Australian and Canadian Armies selected the Leopard 1 as their Main Battle Tank as a replacement for the aging Centurion tank. Several options were examined by both nations before the Leopards were selected in the mid-1970s. The result was the Australian Leopard AS1 and the Canadian Leopard C1. Both tanks were modified versions of the German Leopard 1A3. Both the AS1 and the C1 had distinct recognizable modifications for each country. The Leopard AS 1 is now retired and replaced by the Abrams. 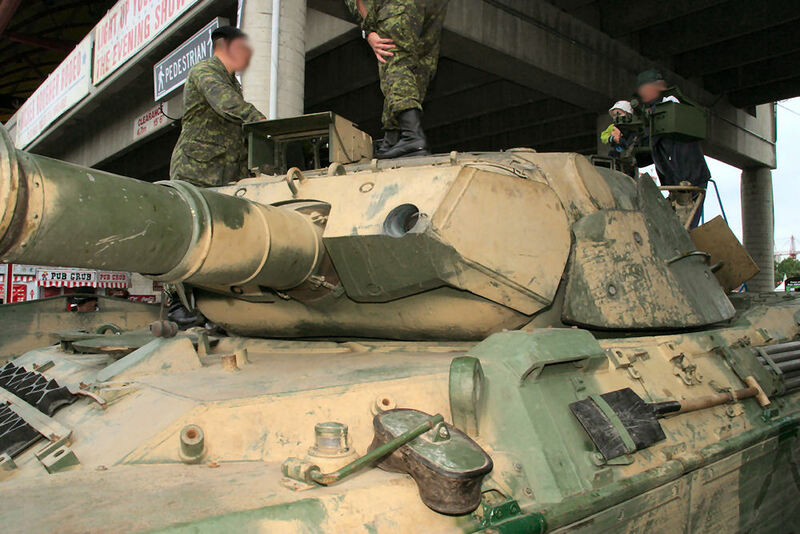 The Leopard C1 was upgraded to the Leopard C2 in 2000. The Leopard C2s are still in service in 2015 but will eventually be completely replaced by the Leopard 2 series. The Leopard C2 uses the same thermal jacket clamps as the C1. 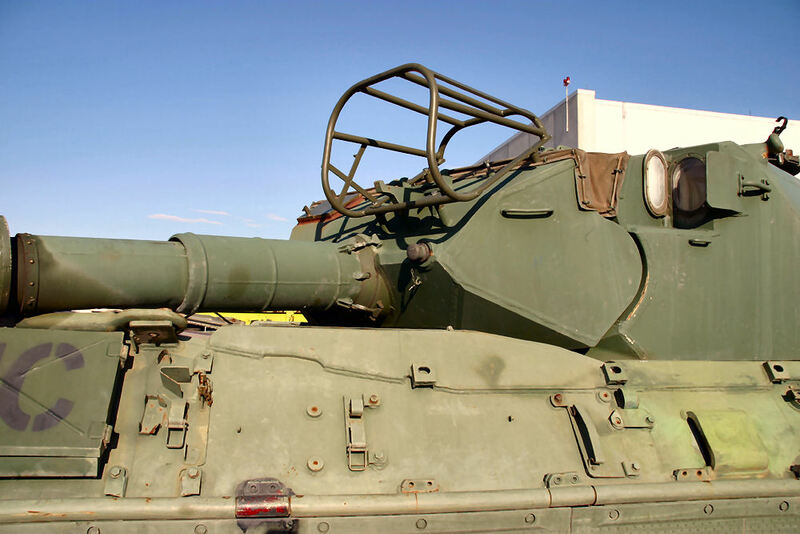 One of the much less recognizable details on the tanks were the clamps on the thermal barrel jackets used on the L7 gun. In a nut shell for non-Leopard type modellers the barrel jackets assist in reducing potential barrel bend/warp by evenly distributing heat built up on the barrel during firing. 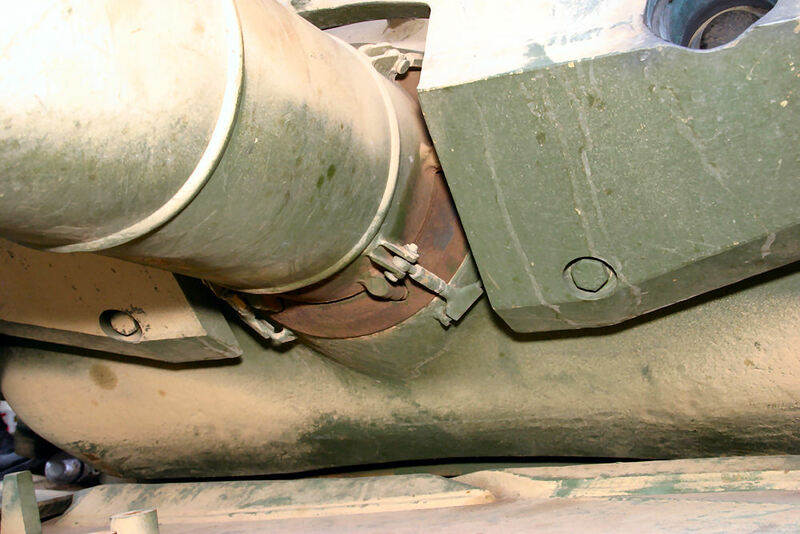 On all L7 guns fitted with thermal jackets other than the Australian and Canadian tanks the clamps are a half circle part that attaches the upper and lower sections of the forward thermal jackets. On the AS1 and C1 the barrel clamps have simply been replaced with a full circle ring clamp. These clamps are industrial style that can be tightened or loosened with a flat tip screwdriver. The Leopard Workshop has produced several new Leopard 1 barrels to suit the needs of detail minded modellers. Using a wealth of reference information the Leopard Workshop has taken a hybrid approach to producing the L7 by combing both resin and turned metal to capture all the details required to display the L7 in multiple configurations. One of the L7 guns recently released caters to the modellers wanting an accurate gun for their Australian and Canadian Leopards. These nine parts will create the L7 as it was used on the Leopard AS1 and Leopard C1 and is still in use on the few remaining Leopard C2s. The turned metal barrel is nicely produced. The taper is visible and adds to the look of the barrel as it reaches the gun trunnions and mantlet area (although this is covered by the barrel jackets). The barrel is designed for use on the Italeri, Revell, Takom, and Meng Leopard kits. This is a great option for modellers with old or new kits awaiting refit with a new aftermarket barrel. The remaining eight parts are cast in a cream coloured resin. Overall the detail is very nice. On the real tanks the barrel jackets do get dings, scratches, and crinkles. The resin parts do display a bit of this effect simply from the casting process so do not expect pristine looking components. I did not notice any warping of the resin parts. All of the resin parts will require cleanup to remove the casting blocks. Be careful not to remove the weld seam on the bottom of the fume extractor as it is supposed to be there. Keep in mind that only the Leopard C2 will use the collimator on the muzzle counterweight. Assembly of the barrel follows a sequence in order to put the parts on the barrel in the correct order and to ensure they are placed properly. All of the parts are designed to slide over the metal barrel. Some are a bit snugger than others and this is perfectly OK. There are a few details that are absent and they will need to be added by the modeller. The first missing detail is the "T" shaped locking clamps that attach the mantlet end portion (base unit) to the actual mantlet. These can be sourced from aftermarket PE set or you will have to scratchbuild the parts. They are prominent on the L7 thermal jacket and a must have in order to properly attach the part on the real machine. The second component missing has to do with the two halves of the forward barrel jacket. On the Leopard Workshop set three parts actually should make up the actual upper and lower thermal jacket upper and lower halves. The upper and lower front thermal jackets extend from the front of the fume extractor to the muzzle counterweight as two long pieces. The top half overlaps over the bottom half. The lock ring is not actually a lock ring. It is the end of the thermal jacket. The upper and lower have fit together and four permanently attached clamps hold them together over the actual locking ring underneath. Also missing from this barrel is a section of the thermal jacket in between the thermal sleeve rear and thermal sleeve front. The instructions state that there is a “spacer” piece that needs to be placed in between the front and rear sleeves. This is incorrect and the entire component should be a single piece. That being said, Leopard Workshop does explain that due to casting limitations that this piece cannot be produced in resin. The suggestion is to create the “spacer” with a piece of paper. This will likely create a false seam and the entire section should blend together. As well, wrapping paper around the barrel will not replicate the overlap of the top section over the bottom section. My suggestion would be to use metal foil and cut two sections for the gap. The top section will overlap the bottom section thus carrying through the horizontal seam where the upper and lower thermal jackets come together. This would require applying the bottom section first and then adding the top wrap in order to create the overlap and create the blended horizontal seam running along the length of the upper and lower barrel jackets. Clear as mud? Clean up of the resin of the parts needs some special attention. Use good reference images to make sure you know what you are cutting and sanding before you put blade to resin. I found the muzzle counterweights particularly delicate and careful sanding is required to remove the casting lug and ensure the shape remains round. The casting lug on the muzzle counterweight with the collimator designed for use on the C2 cuts horizontally across the clamps. It is very difficult to sand off the resin lug without losing the detail of the clamps. It would be easy enough to sand off all the detail and simply add very thin styrene strips or PE pieces to replace the lost detail. Even though I was very diligent with the sanding I still lost the clamp detail and even created a gouge into the rear edge as the resin became very thin. Putty and sanding after attachment will sort this out. The barrel jacket components are easier to cleanup and do have very nice details. As mentioned in the Introduction the Canadian and Australian barrel jackets have ring clamps around the entire barrel jackets. The adjustment screws go at the bottom of the jacket (to simply facilitate easy access for tightening and loosening on the real tank).Ensure that you follow the correct assembly sequence and test fit everything before applying glue. There is some leeway with placement of the base unit and sliding collar. As I mentioned previously the sliding collar actually sits a bit inside the base unit. Why you may ask? Because the gun has to recoil when fired and go back into battery when it is fired. As the gun recoils the sliding collar moves into the base unit. The base unit is attached to the front of the mantlet so it is static. Again, use reference images for correct placement as depending on how much you slide the collar into the base unit will impact the spacing of all the other parts. If you keep the base unit flush with the rear of the metal barrel and then work forward you should be OK as long as you don’t slide the collar too far inside the base unit. I did a Mk.1 eyeball side by side comparison to the 1/35 Leopard C2 drawings in Volume 3 of the Leopard Trilogy with the Leopard Workshop barrel. I was very happy to see the lengths were the same. The instructions are simple and straight forward. A single sheet provides a view of the parts, the proper placement of the parts, and the positioning of the barrel on the mantlet. There is a flat notch on the end of the barrel that should face to the left side in order to use the barrel universally on all the Leopard kits previously mentioned. There are small colour images on the reverse side of the instructions that show close ups of the fume extractor details. Some of the parts look similar whether you have them the correct way or not. Ensure you know which end goes where and which details should be on the top and bottom of the jackets when attached to the barrel. A well-crafted and nicely detailed barrel to improve the look of your Leopard C1, Leopard C2, or Leopard AS1. This is the only aftermarket barrel specifically designed for the Canadian and Australian Leopards. Highs: Definable details on the metal barrel and resin parts. Lows: No mantlet clamps and the “spacer” on the jackets may create accuracy issues. Verdict: Recommended for your Canadian and Australian Leopard 1s. Thank you again Jason. I would like to clarify the point about the T-brackets that hold the sleeve onto the mantlet. These are NOT missing from the kit as the sleeve components start in front of the T-brackets. These are moulded onto all existing plastic Leopard 1 mantlets, though not vey well done in all cases. I did consider producing etch brass replacements, but this would mean surgery to said mantlets. Also one of the selling points of these barrels is the total lack of etch in these sets. I also dispute the statement about parts missing from the forward sleeve. I chose to split this into three for ease of casting. It is very, very difficult to cast long lengths of tube accurately, so this was a sensible breakdown. The idea of a wrap between the two sections is also perfectly sensible to 'simulate' the joint over the top of the sleeve. There is no need for a wrap underneath unless you use a micrometer to measure it. Granted some filler will be needed to blend the top sections. I used layman's terms in the instructions to avoid confusion. I was disappointed by the way the casters used casting blocks - especially overly heavy ones on the collimator and counterweight. This was out of my control. Sorry for the long-winded comments but I feel I have to clarify these points. I think it comes down to what a modeller can live with as far as details on the barrel. I completely understand the approach taken in casting larger parts and the trade off for accuracy. 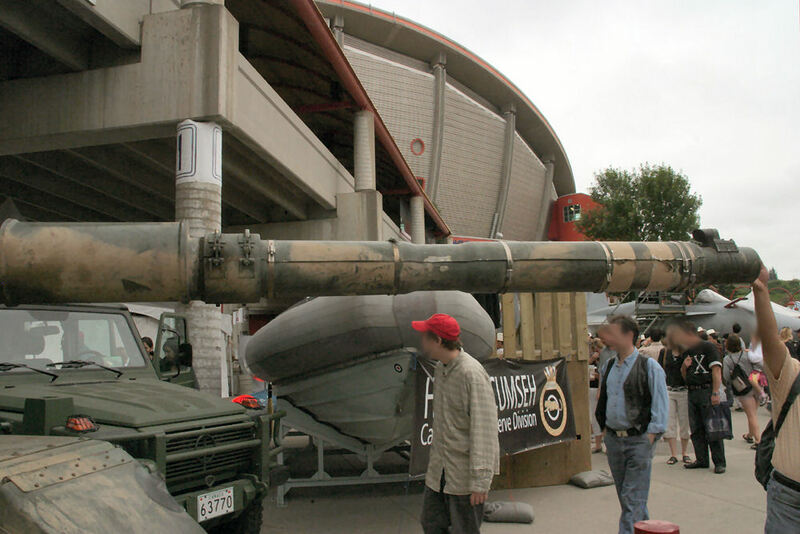 In Dan Hay's image of a Canadian Leopard C2 from Prime Portal one can see the large single piece upper and lower thermal jackets. There is only the horizontal overlapping seam between the upper and lower halves and a smooth transition between the wider portions. Whether tape or foil or another approach is taken the horizontal seam is a detail that should flow through the entire component. This is not a fatal flaw in the Leopard Workshop barrel but simply a detail that modellers should be aware of so they can choose how to or not to tackle it. The clamps attaching the Base Unit to the mantlet are a similar issue. I understand the approach to not include PE parts. Very admirable with respect to keeping costs down. But, it is still a detail that is visible and missing. Again, not a fatal flaw hence the overall 90% review rating a thumbs up recommendation for this product. Another detailed view of a Leopard C1 barrel taken by Day Hay on Prime Portal. I think that clarifies the issue quite well Michael. What you have done with the resin Base Unit is actually provided a shortened version in order to compensate for the rest of the Base Unit parts already present on Leopard 1 kits. "This is the only aftermarket barrel specifically designed for the Canadian and Australian Leopards."